Hi there, and welcome back to our blog! We have been looking at some of the best ways to prepare for welcoming a puppy into your home. Our focus in the last few blog posts has been on the necessary puppy supplies you will want to get before you even bring your puppy home. From a kennel, chew toys, and a collar and leash, to grooming supplies and a puppy playpen, we’re covering it all! Let’s look at a few more essential puppy supplies in today’s post before moving on to our next segment. Some puppy parents prefer to feed their dog canned, wet food, rather than kibble, which is all a matter of preference. However, having canned food on hand has many advantages for keeping your puppy occupied. The KONG toys we mentioned in the last blog have special holes and crevices where you can place treats and other goodies for them to work at getting out. One cost-effective trick is to fill your puppy KONG toy with canned food and freeze it. This will give them a nice frozen treat to work on while you get things done around the house. We recommend making a bunch of small, hand-rolled canned food globs that you can freeze and add to your KONG toy. This is a great way to get them used to your daily routine, too. You can give them their frozen KONG treat while you’re getting ready for work in the mornings or while you’re cooking dinner in the evenings. Use high-quality food that is free of fillers and other high-fat, high-calorie ingredients. You may not want to put a dog bed in your puppy’s kennel while you’re away as they will likely chew on the bed (opt, instead, for an old towel or blanket). It is a good idea, however, to have one for sleeping on at night. If you’ll be kennel-training them, place a small dog bed in their kennel at night. Otherwise, place the dog bed near your bed at night. One of the joys of owning a dog is all the time you’ll spend picking up your dog’s poop. Not really! But get used to it right away, because it’s part of the responsibility of dog ownership. Whether you stock up on grocery bags to use as poo-picker-uppers, or you get those handy bags you can clip right onto your leash, you will want to have bags at the ready for cleaning up your yard and for picking up your pup’s poo while on walks or playing at the park. 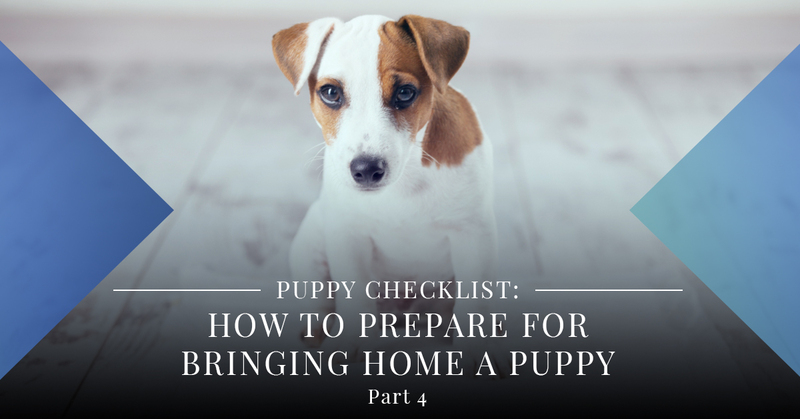 This concludes our puppy checklist segment which has focused on the initial supplies you’ll want to purchase before bringing your puppy home. Next, we will look at tips for puppy-proofing your home to keep your dog safe and healthy, while also protecting your belongings. If you have any questions about your puppy or want to schedule them for a pet wellness exam and core vaccinations, please call our animal care team. At Eagle Animal Hospital and Pet Resort in Northland, we’re here to help puppy parents during this exciting time however we can, so contact us today.